Jardine Marine Services (JMS) has been operating for the past decade in the Marine Industry. Jardine Marine Services was started by Mr Jardine eleven years ago as a transport services company with just Safmarine as its only client. The business currently services over twenty customers, mostly in the Marine and Mining Industry and has tapped into other ventures in its efforts to continuously grow. The business changed ownership in early November 2010 and has expanded ever since. A new division of JMS was created to service the demand for a reputable and reliable supply of equipment to the Mining and Marine industries. 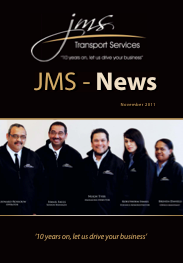 Still continuing using the JMS established name and brand the management and staff foresees steady growth. We are a dedicated team, always improving on our services to our customers. We can be relied upon and have a never say ‘NO’ policy within the boundaries of our service catalogue. With more than a decade of experience in the Industry we understand your requirements better than anyone out there. Employees often find stability and comfort in the culture of the company. JMS provides that by employing self-motivated and reliable and forward thinking individuals that works well in teams and alone and that will apply the company values in their day to day professional lives. Basic values such as Accountability, Commitment, Honesty and Contribution are the kinds of principles that will help our organization form and hold its shape in the frantic pace of Marine and Mining industries.